Gay & Fisher. The Commission for Relief in Belgium. 1929. Chapter Nine. The siege of the Central Powers did not actually begin until seven months after the outbreak of the war. By that time the short war theory and the hopes of a quick decision by decisive military action had been shattered. On the military fronts the armies had dug in and the war of movement settled down to a war of position. On the home fronts, likewise, governments adopted new tactics, based on the grim realization that victory would rest where the resources of man power, materials, and morale longest endured. Near the end of 1914 Germany placed her food supplies under public control, and Great Britain answered by declaring food contraband. In retaliation for this "hunger blockade" Germany proclaimed a U-boat blockade of the British Isles with the "war zone" decree of the 4th February 1915. Three weeks later (1st March 1915) the British issued the Reprisals Order, with the object of stopping all sea-borne commerce of Germany, whether direct or by neutral ports. Thenceforward the Allies sought continually for new means to stop all holes in the encircling barrier, while the Germans were no less diligent in their efforts to conserve the resources of the Empire and the occupied territories and trust the U-boat to force their enemies to raise the siege. These siege operations, naturally, had a much more direct bearing on relief than the costly military assaults launched in Galicia, at Verdun, on the Somme, or along the Chemin des Dames. Relief operations were, from the Allied point of view, a concession from the strict blockade; from the German, a limitation on the utilization of the resources, human and material, of the conquered provinces; and the C.R.B. was under severe pressure from hostile groups in both camps. Despite all this, the strength of the Commission steadily grew until by 1917 its international position was so firmly established that it continued to perform all but a few of its functions, although the American declaration of war had ended the neutral status of its chairman and his associates. The opposition which gathered against every attempt made after the spring of 1915 to extend the activities of relief shows the growing intensity of the economic war and reveals the pressure on the Commission from both besiegers and besieged. There are many instances in the chapters of the preceding volume---the exchange operations, ship ownership, the control of native produce---and there are even more striking examples in the chapters which follow. In its endeavors to protect Belgian and French civilians from forced labor, the Commission succeeded only in diminishing the severity of German military methods. The attempts to revive Belgian industry and to extend relief to Poland failed, but these failures or partial failures involved no loss of prestige by the Commission. They indicate rather the obstacles to relief which existed after the spring of 1915---obstacles so numerous and formidable that had Hoover relied on temporary expedients, on informal guarantees, until after the siege began, the structure of relief, if it had arisen at all, would have been far less imposing and far less of a protection to the people of Belgium and Northern France. Every industrialized country in the world was staggered by the sudden disruption of the world trade in August 1914. In every case, with one exception, there came, after a painful period of unemployment and financial stress, a gradual readjustment to the new conditions. Production was adapted to war needs and as long as raw materials were accessible or the reserve supplies lasted, plant and labor were fully employed. The exception was Belgium, perhaps the most completely industrialized state in the world and, with the possible exception of Great Britain, the most dependent upon access to raw materials and markets. The prosperity and well-being of a great majority of the Belgian people depended on the continued operation of their factories, and a majority of these plants looked abroad for the raw or semi-manufactured materials from which they made a finished product. 2. An intensification of the social problems of unemployment followed the closing of the factories, and under the abnormal conditions of the occupation there was serious danger of deterioration of the morale of a numerous population unable to support itself and dependent on charity. The Commission realized that if even limited industrial production could be started not only would the social problem be ameliorated but the financing of relief---always an acute question---would be assisted through the sale abroad of Belgian manufactures. It was for these reasons that the Commission interested itself in an attempt to secure an agreement with the belligerents which would permit the revival of Belgian industry. These negotiations, begun in the summer of 1915, continued for a year and finally broke down when the Germans definitely refused to meet conditions regarded as essential by the British Government. Fundamentally the failure of the project was due to the strengthening of the blockade policy of the British and the intensification of the efforts of the Germans to defeat the blockade by the exploitation of the occupied territories and by the utilization of neutral intermediaries of trade. Very soon after the German occupation became established and conditions stabilized after the upheaval of the invasion, certain Belgian industrial interests began to investigate the possibilities of renewing the import of raw materials and the export of finished products. They got into communication with Dutch interests and also approached the Commission with the idea that raw materials might be brought in under guarantees similar to those respecting food supplies. During the first months of its operations the Commission was deeply involved in securing the diplomatic guarantees, the finance, shipping, and food to defeat the threatened famine and was in no position to take up the industrial question, which was highly complicated and of secondary importance. By the summer of 1915, however, the status of the Commission was such that Hoover felt justified in attempting to work out with the British and German authorities and the Belgian interests an arrangement by which some, at least, of the wheels of Belgian industry could be started. In presenting the matter to the British Foreign Office he pointed out the relation of the industrial to the relief problem, particularly in respect to destitution, which had rapidly increased in the first months of 1915, and to the financing of food imports, which was then in a critical condition. Hoover recommended the acceptance of a proposal worked out in Holland to establish a neutral industrial commission to handle Belgian exports and imports, with the provision that the balances due Belgian individuals, as a result of these operations, be returned to them through the medium of the Commission. It is not necessary to dilate upon the unparalleled extent of the destitution in Belgium. The destitution is in the main wholly a problem of unemployment, and, moreover, not only is the relief of the destitute a factor of the amount of unemployment but also the whole question of the ravitaillement of Belgium is closely interlinked with this problem. If certain manufacturing industries could be rehabilitated, if their products could be exported, if the raw material could be imported, not only would the workmen be employed and thus taken off the relief side, but also a monetary balance would be created outside Belgium in favor of that country. If such monetary balances were handed over to this Commission, foodstuffs could be purchased therewith, and these balances paid to their owners in Belgium, in Belgian paper currency, from the food-sale receipts, and thus the problem of the ravitaillement of that portion of the population which could pay for their food could to a large degree be made to revolve upon itself. It is impossible to estimate that amount of actual unemployment in Belgium. A recent inquiry into certain trades enumerated as unemployed 760,000 men, 270,000 women, with 619,000 children dependents. This census, however, was wholly inadequate as an expression of the entire situation. This stagnation, which has been practically complete for the last nine months, bids fair to last for a considerable time yet, and the moral and physical deterioration of the working population is already in evidence and must seriously increase. I am greatly impressed with the sincerity and desire of General von Bissing and his associates in the civil government of the Occupation Zone to get these people back into some kind of occupation. The most practicable form of occupation is, not on public works or other forms of "relief" labor, but in the industries in which they are normally employed. A considerable number of these industries are engaged upon materials of non-contraband character and if the restrictions placed by the Allies upon overseas export from Belgian territory could be so relaxed that this type of produce could be exported, it is my belief that it would receive no obstruction from the German authorities, who, as I have stated above, are themselves anxious that this unemployment could be reduced. It is useless, however, to consider the problem as merely one of exports because Belgium is not a producer, except in a few minor industries, of raw material. It is my strongest belief that the proposal from Holland for the creation of a neutral industrial commission which could receive such exports, market them, and could in turn purchase and import raw material for the manufacturers, would not only be a move in the right direction but could be the greatest contribution towards the relaxation of the calls upon our Commission in its work of provisioning the Belgian people. If such an institution were established, I cannot too strongly recommend that it should be stipulated that the sums in balance due to Belgian individuals and firms as the result of their operations, should be handed to this Commission. Furthermore, I believe that it is fundamental that it should be stipulated that the exchange rate should be maintained at 25.40 Belgian francs to the pound and its proper corresponding figure in dollars or guilders. This latter point may appear an unnecessary refinement of detail, but it is much more vital than might appear at first sight. This Commission is conducting the whole of its transactions in Belgium on the basis of the 25.40 exchange, although the Belgian franc is today quoted at an equivalent of about 30 francs to the pound in Holland. If we were compelled to adopt this depreciated figure of exchange, it would be necessary for us in turn to increase the price of foodstuffs throughout Belgium by over 25 per cent and thus add to the accumulation of misery already existing. If it were insisted on as a condition of the organization of such a neutral body that the balance of sums due Belgium should be handed to us to be paid out by us in Belgium, I believe a considerable portion of the financial problem which we are called upon to face would not only have been solved, but an exchange rate of 25.40 would not affect the intrinsic position of any Belgian industry, for if we increase the price of food by 30 per cent the manufacturers must increase wages. I also consider that it would only be a proper course if it were stipulated that such portions of the exported manufacture which are destined for North and South America, India, or such places as are served by our steamers, should be handed to us for transportation from Dutch ports. As these steamers now return to these ports in ballast, the cost of transporting foodstuffs would be considerably modified by any outward freights which we could obtain. I should like to mention that I was informed in Holland that one of the objections raised by the Allied Governments against such operations of such a commission was the necessary relaxation of the restrictions as to monetary exchange with foreign countries which such operations involved. If, however, the balance of the sums due to Belgians as the result of the above operations were handed to this Commission and transmitted to Belgium in the form of food the ground for such objection must have disappeared. I enclose you herewith a memorandum on the present relief situation in Belgium. It appears to me that the position in Belgium can only be met by some definite action in the creation of productive employment. This can only be done by stimulating manufacture, and this involves non-contraband exports from Belgium and, of equal importance, the import of necessary raw material. Aside from its effect on unemployment, and therefore our work in Belgium, the opening of this trade is of importance to the Allied Governments because, whereas we export from this country something like £2,000,000 in money per month to the Western Hemisphere for foodstuffs, the stimulation of exports from Belgium will result in bringing back to this country, under the scheme which I propose, probably a greater sum than this, and any effect which we at present have on an adverse exchange position will have been neutralized. a) With the Allied Governments, permitting the importation of non-contraband raw material into Belgium and the exportation of non-contraband manufactured goods made therefrom and from local Belgian raw materials. b) An agreement with the German authorities by which they undertake not to requisition or in any manner consume the raw material or the products made therefrom and to facilitate the importation and exportation of such material. 2. The neutral Commission for Relief in Belgium to establish a sufficient staff of inspectors, both in and out of Belgium, to see that these guarantees are faithfully complied with, and to provide the necessary machinery otherwise involved. 3. It is proposed to organize each manufacturing industry into a syndicate; that this syndicate should send its own representatives abroad, who would arrange for the purchase and importation of raw material, and for the exportation and sale of the manufactured goods of the syndicate involved. 4. That the difference between the cost of raw material and the realization from manufactured goods should be handed to the Commission, and by them deposited in English banks to the credit of certain Belgian banks until after peace is declared. 5. The Belgian banks in Belgium to undertake to loan to the syndicates in Belgium local paper currency against the security of deposits in London, to a sufficient extent to enable them to pay for their labor and the purchase of local raw material. Under the above plan there would be no monetary increment into Belgium and a large amount of employment could be created. It is proposed that each type of manufacture should be taken up as rapidly as it can be organized and as the character of its raw material and exports are approved by the foreign governments. The relief work in Belgium comprises two entirely distinct and separate problems. The first is the provisioning of the country with the minimum of supplementary foods to the native production. This is being accomplished through the Commission for Relief in Belgium and the Comité National in joint co-operation at an expenditure of from £1,500,000 to £2,000,000 per month. The second is the most difficult problem, and arises from the fact that even if food existed in abundance in Belgium, owing to the complete industrial stagnation, the working classes are day by day becoming less able to pay for it, and the problem of caring for them by public charity is assuming financial dimensions entirely beyond any possible compass. Therefore it is one thing to inject into the country sufficient foodstuffs which if spread equally over the entire population would give them sustenance, but it is entirely another thing to enable the very large section of the community who have no resources either to purchase these foodstuffs for themselves or alternatively for the relief committees to purchase it and distribute it as a matter of charity. Since the occupation of Belgium there has been a gradual tapering off of manufacturing industries, due to the gradual exhaustion of raw material and also the financial exhaustion of the employers. There has been a great effort by the large manufacturers to employ their work people at a certain minimum per week, regardless of their effectiveness, but one by one they have become exhausted and a correspondingly large number of people have been thrown on the responsibility of the relief organizations until it has now reached appalling dimensions, the number of people being assisted today having now reached over 2,750,000. The whole basis of the organized relief is to use the funds secured from abroad to supplement the resources of the local committees and the local relief committees in turn supplement the resources of the individual. At the present time about £1,000,000 per month is being in effect made available from abroad with which to supplement the local committees and in addition to this contribution to the local committees by public benevolence, and from the communal authorities out of taxation furnishes about £200,000 per month. This amount of money, spread over the above members, amounts to less than thirty centimes per them per capita of destitute, and inasmuch as the very minimum on which life can be preserved is sixty centimes per diem, it is evident that the money now being applied is only supplemental and that with the complete exhaustion of local resources about £2,500,000 a month will be necessary even if the numbers do not increase. a) The superior commercial and wealthier classes and their dependents, which comprise approximately 2,250,000 persons. This class in the ordinary course are able to support themselves by drawing on their reserves, given that food supplies are available in the country. b) The agricultural class and that portion of the population which derives dependence therefrom, the total of which comprises about 1,250,000 people. This class, by virtue of the reservation to them of the present harvest in such a manner that each proprietor retains a sufficiency of seed and food for himself and family throughout the year, the excess being purchased by the relief organization at a good price, are now thus placed in a position of economic security and need give no further anxiety. c) The industrial workers and that portion of the population dependent upon them, which totals roughly 3,250,000. This class largely comprises the mass out of which the above 2,750,000 are recruited. The whole problem is one of unemployment, and unless some remedy can be found for the productive employment of these people their preservation seems hopeless, because the provision of £2,500,000 a month for their support as stated above is beyond all possible accomplishment. The Dutch plan, which Hoover had supported, did not receive the approval of the British Government, which stipulated a greater participation by the C.R.B. than the plan provided for, and suggested that the Belgian Minister in London and Hoover work out a new scheme. This was done and the British agreed in principle to the revised plan. With this encouragement, early in October 1915 Hoover renewed discussions of the industrial project with Belgians and Germans in Brussels, and with Francqui prepared a memorandum on the subject for presentation to the German authorities. 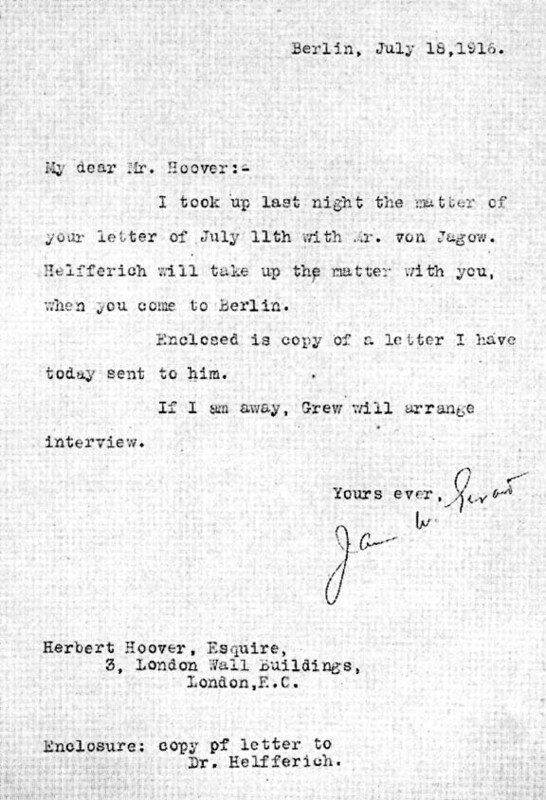 The chances that the proposal would be accepted were not bright, for Hoover had learned that the Germans were as determined to exclude the Commission(273) from participation in the project as the British were to include it. With reference to your Note No. 3879 of the 20th ultimo regarding exports from and imports into Belgium, I have the honour to inform you that His Majesty's Government are prepared to consider the granting of greater facilities to Belgian trade if a scheme can be devised presenting adequate guarantees. I do not desire to offer any criticisms of detail on the scheme(274) proposed in your Note under reply, but I desire to point out that that scheme provides no method of co-ordination between imports and exports. It is clear that the best method of guaranteeing that imports of raw material into Belgium are used for no object which could benefit the enemy will be to check the raw material imported by any given industry against the exports of finished products made by that industry. Strict control of this kind will be essential, and I do not see how such control can be in practice exercised unless both imports and exports pass through the hands of the same organisation. I recognise that the form in which your scheme is proposed arises from the differentiation between exports and imports laid down in my Note of July 31st, but if any considerable imports of raw material are to be allowed, I think that this differentiation must be abandoned and exports and imports must be treated as interdependent. 2. That Belgian industry should be enabled so far as possible to pay in exports for the foodstuffs imported by the Relief Commission, thus relieving the Belgian Government and the Allied Governments of the financial burden involved by their present contributions to the Commission. 3. That facilities for Belgian exports should not afford an opportunity for the supply by Germany of raw material or half-manufactured materials to Belgian industry, thus in effect opening a market for German exports. I venture therefore, to suggest that you should reconsider your scheme in consultation with Mr. Hoover with a view to drawing up a detailed plan for submission to the competent authorities of His Majesty's Government who will consult the French Government in the matter. As you are aware, the general question of Belgian trade has been the subject of many conferences between the office of the Parliamentary Counsel to the Treasury and the Belgian Chamber of Commerce and the views formed on the result of these conferences might well be taken into account in drawing up any such plan. If you so desire, I shall be glad to depute a member of this office to confer with you and Mr. Hoover on the subject and explain more in detail than is possible in written correspondence the general requirements on which His Majesty's Government will feel obliged to insist in any scheme which may be drawn up for their approval. I have the honour to be, etc. 1. A Committee has been organized in Brussels, comprising representatives of various industries, to be known as the Comité Industriel. This Committee is to be under the patronage of the American, Spanish, and Dutch Ministers and Ambassadors in Brussels, The Hague, and London. In addition to the Belgian members it possibly will include Dutch members and also representatives of the Commission for Relief. It is proposed that this Committee shall organize agencies in Rotterdam and elsewhere to conduct the commercial phases of its business and that these agencies should be in truth comprised of the agents of various firms involved. a) That it should be chosen with regard to the maximum employment of labor from the relief point of view. b) That the entire output of the factory should be exported. c) The raw material consumed should be solely of either oversea or undoubted Belgian origin. d) The German Government shall undertake that such factory be free from requisition or purchase of its raw material, manufactured goods, by-products, plant, or equipment. Its entire personnel to be free from interference and influence by the German authorities. e) Such factory to be placed under the protection of the Commission for Relief in Belgium, in the same manner as the food warehouses are at present. The whole of the goods to and from Holland of such factory to be transported by the Commission for Relief in Belgium under their flag and protection. a) This agency to be under the control of an Auditor to be appointed by (?). b) Statistical record to be kept to determine the exodus of imported material. c) At least once a month a balance-sheet is to be drawn up as to the expenditure on imports and the receipts for exports and any excess of receipts over expenditure is to be handed over to the Commission for Relief. The Commission is free to make such counterpayments in Belgium from its local receipts for the sale of foodstuffs as may be convenient to it, at such rate of exchange into Belgian francs as it may determine in conjunction with the Comité Industriel. Any balances over and above such amounts are to be deposited in a neutral bank to be chosen by the Commission for Relief, and a certificate of deposit may be issued by the Commission in favor of the Comité Industriel, such certificate to be cashable only after the declaration of peace. These certificates may be the basis of local loans for payment of wages. d) The first £10,000 of such deposits to be held by the Commission for Relief as a deposit of good faith by the Comité Industriel on behalf of all factories brought under their patronage in the execution of the requirements here laid down, and violation of any of these requirements shall subject this sum of money to forfeiture as a fine, and to the termination of the entire arrangement, the Comité Industriel in turn to assess this particular sum against any particular factory which shall be at fault. 4. The governments concerned are to issue an approved list of raw materials and manufactures which may be handled by the Comité Industriel, and are to approve the names of the firms to whom patronage is extended by the Comité Industriel. a) The names of the firms and the character of the material will have to meet the approval of the Allied Governments. b) The Comité Industriel could collectively have the responsibility for the good conduct of its members. c) There can be no question as to the jealous desire of the Belgians to comply with the objectives of the Allied Governments. d) The arrangements proposed will provide that no money, either paper or metallic, will pass over the Belgian frontier. e) The financial position of the Belgians except as regards the bare employment is in no way benefited by virtue of the financial restrictions proposed. f) The guarantees asked for from the German authorities are sufficiently wide to cover all objects of the Allied Governments. g) The proposed incorporation of the Ministers of the various neutral countries and the execution of final arrangements with them greatly strengthens the protection of the Comité Industriel and gives a background of security to the faithful performance of the engagements. h) The incorporation of neutral members in the executive body of the Comité Industriel gives additional assurance that all the requirements on both sides will be faithfully observed. i) The transportation and storage of all material being carried out in the name of the Commission for Relief in Belgium gives the actual ownership of this material to a neutral body. Altogether I do not see that any wider series of protections can be devised than the above. When all is said and done the whole matter will rest on good faith and I believe that all of the men involved on either side in a desire to further this problem and diminish the distressing unemployment in Belgium are acting in no other spirit than that of perfect good faith. (undated but written about 13 October 1915), by HOOVER, describing the progress of negotiations for the revival of Belgian industry and analyzing the alternatives as result of German objections to the participation of the C.R.B. The position to be taken in the revival of industrial activity in Belgium by the C.R.B. is set out in the attached memorandum which I wrote to the Belgian Minister. I also forwarded copy of this memorandum to the members of the Departmental Committee of the English Government, of which Lord Eustace Percy is the head, and I understood from him that, subject to some minor details the Departmental Committee appeared willing to recommend to the Cabinet the acceptance of this project. One of these details was rather a better German guarantee than appears in this memo. On going to Brussels with this scheme, Mr. Francqui and I drew up a memo quoting this scheme in toto, omitting only the list of assurances which the British Government would have had appear in the latter part of the Hymans memo, and we introduced into the memo which Mr. Francqui and I drew up a prior German guarantee to cover the detail asked for above. This joint memo by Mr. Francqui and myself was to be presented to the German Government on the 11th inst. They had previously had communicated to them, however, the rough details of the same project, at the time of a previous visit to Brussels, and had expressed their general approval in principle. I am of course unable to anticipate the result of the conference of the 11th inst., but it appeared to me from the information I secured in Belgium that the Germans would object to the C.R.B. participation---and on this general question I have written the attached letter to the Belgian Minister. 2. That a Dutch committee should be set up who would become the consignee in and out of Belgium and in and out of Holland. b) There would be competition between the C.R.B. and such an organization, for transport facilities, and in this time of dearth of transport there would be a forcing up of prices and a possible crippling of the food supply, which must always take precedence. If, on the other hand, the entire transportation is in the hands of the C.R.B., back-loading can be obtained for lighters and forward-loading can be adjusted to the necessities of the food supply. c) If the Comité Industriel were set up as the gateway it would only be a short time before the Germans would advance the proposition that the Comité National should also become its own transportation and distributing agent---as they cannot be otherwise than desirous of eliminating all neutral agencies operating in their captured territory. This raises a manifestly serious question as to the whole control of the food supply and its support by the neutral world. d) The other alternative would be a Dutch committee, which to my mind has two objections, the first being that it gives such a committee the practical effective control of Belgian industry. The transportation in the hands of the C.R.B. gives the Comité Industriel a free pipe-line to the outer world, which has no objections either as to profit or control of Belgian activities. Second---it sets up a rival organization in the transportation business, as mentioned above; and---third---it seems to me that it would only be a question of time before the German authorities would advance a proposal that such an organization should take over the food supply as well as the work of the Comité Industriel, as they would obviously look upon the Dutch as a more controllable body than the Americans. I wish it made clear at all times that the one desire of the C.R.B. is to be of service to the civil population of Belgium in its own ultimate interest; that if the crisis should arise that the Germans positively refuse to agree to this extension of the C.R.B. activities and if it is a question of the abandonment of the industrial revival or, alternately, the adoption of either of the above gateways---this is a matter which the Belgians themselves must decide, as to which is to their greatest ultimate interest. We do not wish any sentiment of loyalty to us or any feeling that we would not be pleased to do the best we can under any given circumstances to enter into such a consideration. From advices which I have had from Brussels since leaving I believe that the tension between the Germans and the C.R.B. is somewhat relaxed, and it may be that the Germans will not be so insistent on the elimination of the C.R.B. element in the Comité Industriel as was my impression when I left Brussels. As had been feared, the Germans did not accept the proposal as presented in the Hoover-Francqui memorandum. They did not, however, officially and finally reject it or offer counter proposals, but left the matter in the air while they made tentatives in other directions. They offered to provide Belgian industries with raw materials if the Belgians would turn the products over to the Germans. This the Belgians emphatically refused to consider, whereupon the Germans returned to the idea of a neutral industrial committee with which the Commission should have no connection. This also failed, for such a scheme was unacceptable to the British, and to the French, who were lukewarm to the whole idea of attempting to revive Belgian industry on the ground that to permit the import of raw materials would, directly or indirectly, benefit the Germans. In the meantime, in November, while Hoover was in Brussels, there were further conferences, articles of incorporation for the Comité Industriel were prepared, detailed plans of operation were worked out, and a set of guarantees to meet the chief demands of the British were drawn up. Thus by the end of 1915 the Comité Industriel on paper was ready to begin operations, but on the fundamental issue of the disposition of the value of the exports (i.e., whether the sums received for exports in excess of the necessary expenditures for required raw materials should be turned over to the Commission or deposited in Belgian banks) the British and Germans were as far apart as ever. In order to promote the revival of Belgian industry a Belgian Industrial Committee whose articles of association are annexed, has been created with the object of importing raw material into Belgium and exporting manufactured products. The Belgian industries will be divided, according to their class of activity, in syndicates or groups, whose organization and representation in the Association will be ruled by the enclosed articles. The affiliation to the Association to be approved by the Governor General in Belgium, who retains the right of withdrawing at any time the said approval. Provided that, under these conditions, the affiliation to the Industrial Association of the different branches of the industry and the works pertaining to them should have been approved by the Governor General, the guarantee is given that raw material imported, in consequence of the present agreement, and finished products resulting therefrom, shall be free from requisition of any kind whatever. During their affiliation to the Industrial Association, the free use of the existing installations, machinery, and raw material in their possession, as well as the right of disposing without restraint of the working staff necessary for the continuance of the work, will be guaranteed to the manufacturers. The export of finished products manufactured from said raw material is only allowed (except for products to be indicated afterward, which have no value for war purposes) under the guarantee that these products will not fall into possession of states at war with Germany. The guarantee that, on one side, imported raw material and finished products resulting therefrom shall not be requisitioned and that, on the other hand, finished products (especially mentioned products excepted) shall not fall into possession of states at war with Germany, shall be assured by a Committee composed of persons of neutral nationality, indicated by the Spanish, United States, and Holland Governments or their representatives in Belgium. The head office of that Committee will be in Brussels, a main agency to be opened in Rotterdam. To carry the negotiations with the Industrial Association, with the affiliated syndicates or grouping bodies, and with the neutral Committee, a special department managed by German officers will be created by the Governor General. b) To make the transfers of funds necessitated by these transactions. The seat of the Industrial Committee will be in Brussels. Its activity will be exercised for account of all the industries as if they were a single undertaking, under its management. No factory can be affiliated without the preliminary authorization of the German Government. The affiliated works will endeavor to utilize the maximum of labor in order to relieve poverty. The Committee will include one or several delegates of the different industrial groups and syndicates who will adhere to the present articles and to the regulations here enclosed. a) The Industrial Committee will organize a central office in Brussels and regional offices at places where necessary. b) It will consider all the applications of groups or new syndicates for joining the organization, and after eventual approbation will submit them to the Belgian and English Governments as well as to German authorities. c) It will keep in continual touch with the delegates of each group or industrial syndicate. It will centralize all the correspondence of the different groups or industrial syndicates, which will restrain of [refrain from?] corresponding directly with their foreign customers or suppliers. d) It will supervise the use of raw materials and admit to be worked in the affiliated factories only raw materials originating without doubt from Belgium or neutral countries. It will see that the products shall, except by special authorization, be sent only to neutral countries and will deliver them to agreed destinations in accordance with the stipulations contained in the present articles and in the annexed regulations. All the goods forwarded from or to Holland for account of the Industrial Committee will be shipped under the control of the Neutral Committee. e) It will have to centralize all the accounts relating to imports and exports. For this purpose it will keep general accounts of the receipts in materials, exports of products, and money transfers with foreign countries made for account of affiliated manufacturers or firms. f) In order to look after the movement of import and export, an office is to be opened at Rotterdam and, if necessary, agencies in the neutral countries to which export will take place. g) It will look after the strict observance of the regulations here enclosed. These regulations may be modified at any time by decision of a simple majority of the Industrial Committee; each affiliated group or syndicate agreeing, beforehand, to accept the said regulations. h) It will be empowered to inflict penalties against affiliated manufacturers or firms who will have failed in their engagements. For this purpose the first million of francs proceeding from the sale of exported products will be appropriated to the guarantee of the engagements taken by the groups or syndicates in forming the Committee. Every breach of such engagements will expose this sum to be seized by the representatives of the Neutral Committee to the benefit of the Comité National de Secours et d'Alimentation. The Neutral Committee may also cause the exclusion of the failing group, syndicate, or factory. a) This office will include one or several delegates of the Industrial Committee. b) It will be its duty to centralize, under the control of the Neutral Committee, all the movements of the imports and exports oversea or to the neutral countries, as well as the money transfers with foreign countries. All these accounts will be audited by a chartered accountant and might be submitted to the inspection of the belligerent Powers. d) The surplus of receipts over expenses will be deposited monthly in neutral banks, under the control of the Committee of Neutrals, in order to assist eventually the needs of food supplying. These deposits will be represented by certificates. These certificates can be used, wholly or partly, for the purchase of food for the Belgian people, and this, at an exchange rate in Belgian francs which will be fixed in accordance with the Industrial Committee. In this case, the Comité National de Secours et d'Alimentation will remit, to the Industrial Committee, the equivalent in Belgian francs, of the amounts realized on these deposit certificates, and the Industrial Committee will divide them between the beneficiaries of the certificates to whom refer the realized payments. The amounts not used for food supplies will remain deposited in a neutral bank until the cessation of hostilities and the deposit certificates of these amounts will be remitted to the Industrial Committee, which is authorized to use them as collateral for loans, granted by banks in Belgium, for the payment of salaries. e) The Rotterdam Office will have to direct to the foreign countries and under the control of the Neutral Committee, all the products exported from Belgium and to ship the imported raw materials to the industries which will be indicated by the central office in Brussels. 1. The Industrial Committee is formed from the delegates of various groups or industrial syndicates who have adhered or will adhere to its articles of association. They are elected for the term of one year and are re-eligible. 2. The Committee's head office is established at the Société Générale de Belgique. 3. The Committee selects among its members a Chairman and two Vice-Chairmen. The Chairman and Vice-Chairmen are elected for one year. They are re-eligible. 4. The Committee meets as often as required by its interests and at least once a month upon convocation of the Chairman. 5. All resolutions are taken by the Committee on the ordinary majority of the delegates' votes. In case of division, the Chairman's vote is cast. 6. The Committee is empowered to appoint amongst its members an Executive Committee entrusted with the carrying out of the resolutions taken. 7. The Committee has the most extensive powers for carrying out its object. It takes all necessary steps to this end and has the right to create auxiliary branches in the provinces as well as abroad. 8. The Committee takes under its protection and control the factories of the affiliated groups or syndicates. 9. This protection and this control will affect only the material and products covered by a regular pass and intended to be imported, stored, manufactured, and exported through the adherents. 10. The said adherents bind themselves toward the Committee to observe scrupulously all the stipulations of the diplomatic arrangements agreed upon as to the reception and the use of the imported goods and the products to be exported. 11. The affiliated factories are immediately to inform the Committee of every infringement of the arrangements stated in the previous article. To this purpose the said factories will establish and send immediately to the Committee a detailed report ascertaining the facts and giving the names and addresses of witnesses whose testimony could be called upon. 12. Whenever the adherents will be in possession of a regular pass they will have to deposit in the cash offices indicated to them for this purpose a security in cash or values agreed upon by the Committee, this security guaranteeing toward the Committee that the adherents will observe every engagement subscribed by them. In case of breach of these engagements the Committee has the right, by decision indicating the grounds on which it is taken and without appeal, to seize, for the benefit of the Comité National de Secours et d'Alimentation, the whole or part of the said security. 13. The managers of the syndicated manufacturers bind them selves to inform the Industrial Committee in Brussels of every infringement of the engagements taken toward the Committee by any authority or work in order that they may at once be reported to the Neutral Committee. 14. The adherents bind themselves to accept and pay, within the month of its presentation, the bill for their share in the general expenses of the offices opened by the Committee in Belgium or abroad. To cover the first general expenses, they will pay a provision of 10 per cent on the amount of capital invested in their business or calculated on such other equitable basis as will be arranged by the Industrial Committee. The manufacturers having closed contracts through the Industrial Committee will have to deposit 1 per cent of the amount of their transactions to cover the general expenses incurred by the Committee and its agencies. Should this amount of 1 per cent be insufficient to cover the said general expenses, the Committee will be empowered to debit the balance to the general provision of 10 per cent. a) The names of the participating firms. b) The internal regulations of the group. c) The raw material with their approximate quantities to be monthly imported. d) The manufactured products to be exported monthly with their approximate quantities. a) That every member of the group or syndicate adheres to the principles put down by the Industrial Committee and binds himself to observe them strictly. b) That all correspondence concerning the importations, exportations, and money transactions must pass through the Industrial Committee. c) The system of control on imported material and exported products to be established in their factories. d) The system of bookkeeping. e) The penalties for infringement on the regulations. 16. The Committee will fix the penalty for breach of the present regulations in every case. 17. The Industrial Committee might, at any time, upon the majority of the groups and syndicates affiliated, modify these regulations. Mr. Francqui will have mentioned to you his conversation in this office with Mr. Nobel, representing the French Army General Headquarters, who, on behalf of General Joffre to whom I have sent our reports, wanted to obtain various details on the work of the Commission and especially wanted to gather information on the scheme for reviving Belgian industries, concerning which the French Government is today consulted by the British. It seems to be generally understood here that if such a scheme were to come to a head the Commission would be in charge of it, although you remember that I told you that this is not the advice of the French Embassy in London. I am given to understand confidentially that the advice of the French General Headquarters is not in favor of allowing importations into Belgium. The French view is that there are practically no Belgian industries that might not, directly or indirectly, be made to work to the benefit of the German occupants. The principal Belgian industries, such as metallurgical, steel work, coal mining, textiles, are all out of the question; other industries would relieve the situation only to a very small extent and would further complicate the question of freights which is getting so acute. The French General Staff evidently take the view that the Belgian must endure till the war is over and assert that the principal claim in favor of the scheme, which is that Belgian workmen are emigrating to Germany, is not a correct statement. I write all this for your guidance, as evidently here the question is going to be decided one way or the other and an answer to the British Government will be given. Should you desire to submit any arguments or observations that might modify the above views it is high time that you should advise me or come over here for this purpose. I notice that Mr. Francqui was very keen on the subject and wonder whether you are of the same mind. In regard to shoes, I expect to have the export permit at the end of the week. The failure of the Germans to accept the proposals set forth in the preceding documents ended the attempt to revive Belgian industry through the medium of an elaborate organization like the proposed Comité Industriel. In 1916, although there were further negotiations regarding Belgian industry with which the Commission was concerned, new conditions gave these negotiations a different character. During 1915(275) the German authorities had relaxed their original severe restrictions on Belgian exports and certain industries were allowed to export overseas by way of Holland. The British did not interfere with this activity so long as the value of the exports was deposited in a British bank. A portion of these deposits was released for dispatch to Belgium sufficient to pay the wages of the workmen in the factories engaged in producing for this trade. The Commission was not concerned in this arrangement, but when in the spring of 1916 the Germans required Belgian exporters to deposit the full value of the exports, the British threatened to prohibit Belgian oversea export unless the Germans agreed to permit the value of the exports being turned over to the Commission as had been previously proposed in the negotiations regarding the Comité Industriel. The German authorities again did not reply to this proposal but indicated their hostility to it by replacing restrictions on Belgian exports and ultimately prohibiting oversea exports entirely. The matter became a serious one for the Commission when in September 1916 the Foreign Office notified Hoover, through the American Embassy in London, that the British Government would not consider an increase in subventions for relief of which the Commission was greatly in need until the Germans replied to new proposals relative to Belgian exports. Hoover thereupon proposed that the British consent to the continuation of exports and to the return of their total value to Belgium through the medium of the C.R.B. The British agreed, but when Francqui put the proposal before the Germans they flatly rejected it. You will recollect that last November I approached you unofficially on the subject of the scheme then pending for the importation of raw materials into Belgium under the auspices of the Relief Commission. The German Government having neglected to make any reply to the proposals, I was obliged recently to inform the Belgian Minister of the facts relating to the German policy of exploitation carried on in Belgium and to explain to him the impossible position in which His Majesty's Government are placed by this policy. This letter was published and shortly afterwards a reply was issued by the German Press Bureau stating that the German Government had been unable to come to a decision on this subject owing to His Majesty's Government having made it a condition that the value of all exports from Belgium should be deposited in a bank in the United Kingdom. As Your Excellency knows, this statement is false; for the scheme put forward by Mr. Hoover contained no such proposal, but on the contrary provided for the deposit of the value of such exports partly in a neutral bank and partly with the Relief Commission itself to be used for the purchase of foodstuffs. At present, and for a year past, it is, however, true that in the absence of any definite Organisation for Belgian exports and imports, His Majesty's Government have exacted a condition that the value of all articles exported from Belgium under permit from His Majesty's Consul General at Rotterdam shall be deposited in a British bank, only such portions of these deposits being released under licence for despatch to Belgium as are necessary for the payment of wages to the workmen in the factories concerned. It now appears, however, that the German Government are exacting from Belgian exporters an undertaking that the value of everything they export shall be paid into a bank in Belgium. There is thus created an absolute incompatibility between the requirements of His Majesty's Government and the German Government, and the Belgian industries consequently suffer from a conflict of regulations for which His Majesty's Government must hold the German Government primarily responsible. There are only two alternatives now before His Majesty's Government. The first is entirely to prohibit all overseas export from Belgium. This His Majesty's Government are for obvious reasons reluctant to do; but while their present regulations afford ample opportunity to Belgian producers to pay their workmen and to conduct their industries, His Majesty's Government cannot possibly accept a system by which these Belgian exports become a means of strengthening Germany by allowing the whole value of them to go into Belgium and to form the object there of the extortionate levies and fines which the German authorities have imposed on the territory they have occupied. The second alternative is that already offered to the German Government by the Relief Commission, namely, that the value of these exports shall be paid to the Relief Commission and shall be used by them for the purchase of foodstuffs abroad, thus contributing on a business basis towards the work now carried on purely on a basis of charity. I shall be glad if Your Excellency will take steps to confer with the Relief Commission and to lay this offer before the German authorities in Belgium. If those authorities will not accept it, and will not withdraw the conditions they now exact in the case of all Belgian exports, His Majesty's Government will have no choice but to take steps still further to restrict a trade which furnishes financial resource to the invaders of Belgium. The matter of course is one of considerable urgency and Mr. Hoover's presence in Brussels may make it possible for Your Excellency to take the question up immediately under favorable conditions. The Secretary of State for Foreign Affairs presents his compliments to the United States Chargé d'Affaires and has the honour to refer once again to his letter of April 1st in which he requested Mr. Page to be good enough to take steps to confer with the Relief Commission and lay before, the German authorities in Belgium an offer with regard to the conditions under which His Majesty's Government were willing to continue to allow goods to be exported from Belgium. Lord Grey must postpone the consideration of this matter until he is in receipt of the reply to the above-mentioned note, and he would therefore be glad if the United States Chargé d'Affaires will be good enough to take steps to induce the German Government to give an answer without further delay. I have received a copy of a dispatch from Earl Grey to the American Ambassador, of the 23d of September, referring to the negotiations with regard to the importation and exportation of industrial material, the last dispatch referred to being that of April 1st. Before this matter goes forward to Belgium, I would like to make a suggestion that the negotiations leading up to the dispatch of April 1st implied the importation of raw material into Belgium under elaborate control, and the exportation of manufactures. It seems to me obvious that in the present state of the shipping situation it is out of the question to again advocate the importation of raw material into Belgium. Under the question of exports of non-contraband industrial material, this has already had a considerable development, as you know. His Majesty's Government agreed to such exports, conditional upon the money being partially impounded in England, and the Germans, on the other hand, have got out an order that no exports can be made unless all the money is translated into Belgium. It would appear to me worth considering whether this business should not be formulated into one by which approved exports are permitted, the whole of the money to be translated into Belgium, but only through the C.R.B. This would obviously considerably increase our commercial exchange, and to whatever extent this took place it would diminish our demands upon the Allied Governments. I should be glad if you would think the matter over. In accord with the Protecting Ministers the Comité National has the honor to bring to the notice of Doctor Bruhn the negotiations which were previously carried on with a view of obtaining the authorization to export to foreign countries Belgian manufactured products. As Dr. Bruhn knows, the Comité National proposed to organize a syndicate of all the Belgian exporters and suggested the depositing in a bank of a neutral country of all sums resulting from this exportation, it being understood that a part of these sums should be sent to Belgium in order to pay the wages of the workmen and cover the cost of manufacture, that another part should be devoted to the buying in neutral countries of the raw material necessary to Belgian industry, and that the balance would remain on deposit in the aforementioned bank until the signing of peace. These negotiations have had no sequel. Subsequently, however, the Department of the General Government which occupies itself with Belgian industries authorized certain manufacturers, such as glass-makers, to export their products to foreign countries on condition that the total value of these exports returns to Belgium. On account of the difficulties encountered in getting this money back into Belgium, the German authorities decided a few weeks ago to no longer allow overseas exports and only to authorize exports to Holland. As a consequence of this decision the glass works were obliged to close down and pay off their workpeople, thus depriving from earning a living some 150,000 persons, who have become a charge upon charity. The other industries which had been able to take advantage of the authorizations to export which had been granted up to the present time, find themselves in the same case. In order to reply to the views expressed by the German Government to see the working classes return to their work, the Comité National suggest today that authorizations to export to overseas countries be accorded to Belgian industries, on condition that the Comité National shall pay the manufacturers in full the amount of their invoices; the counterpart of these foreign invoices to be paid into the coffers of the Commission for Relief in Belgium to serve as payment for the foodstuffs bought by it and imported into Belgium through its intervention. The Comité National is persuaded that its suggestion will be accepted by the English Government; it is likewise convinced that it will be accepted by the German authorities, for the solution which it recognizes responds to the manifest intentions of the Industrial Department of the General Government as far as the permits to export are concerned. The Comité National will be pleased to receive a reply as soon as possible. If this solution be admitted, the quantities of provisions imported might be, if not increased, at least maintained at the present figures, notwithstanding the considerable rise in prices. On quite a different matter, I suppose Hoover has gone into Belgium fully realising the importance we attach to the Germans accepting our proposal that the purchase money for all exports from Belgium should be paid over to the Relief Commission. This is of the first importance as we know that the Germans are using their refusal to permit exports except on condition that the whole purchase money for such exports shall be paid into a bank in Belgium as an additional means of forcing Belgian factories to close down in order that the unemployed workmen may be forced to go to work in Germany. BRUHN TO THE COMITÉ NATIONAL, declining to permit the transfer of the value of exports through the C.R.B. In continuation of our letter No. 7361 of the 11th inst., it is respectfully stated that that portion of the proposals of Mr. Francqui in his letter of the 9th inst., which refers to the exchange of the value of the permitted exports of the glass industry for foodstuffs through the medium of the Commission for Relief in Belgium, has not been sanctioned. If, and how far, the export of glass may be sanctioned has still to be considered. The decision will be made known to the interested parties. There was no further attempt to revive the question of Belgian industrial exports. The effects of the blockade and the shortage of man power had become so acutely felt in Germany that the Government embarked on a thorough-going policy of exploitation of the industrial resources and man power of the occupied territories. The most sensational application of this policy in Belgium and Northern France was the institution of forced labor. The Commission's connection with this policy is treated in chapter x. Following your letter of the 6th inst., we addressed the German Vermittlungsstelle of the C.N. in a note, copy of which we transmitted to Your Excellency and in which, following the desire manifested by Your Excellency, we suggested that export to oversea countries should be permitted to the manufacturers of the Belgian industries, on the condition that the Comité National should pay fully to these manufacturers the amount of their products; we proposed at the same time that the counter value of these exports abroad should be paid into the account of the Commission for Relief in Belgium to serve as payment for foodstuffs to be bought by them and imported into Belgium under their control. We were guided in making this proposal by the wish to render possible the labor for Belgian workmen and thus to respond to the views expressed by the Governor-General to see the laboring classes return to their occupations. We had pointed out on this occasion the unhappy situation in which the glass-workers found themselves, condemned to idleness by the prohibition of the German authorities of export other than to Holland. Finally we added that we were persuaded that this suggestion would be acceptable to the British Government. We have just received in reply to this communication the note, copy of which we attach for Your Excellency. This note has the more astonished us as the suggestion which we made corresponded entirely to the intentions manifested formerly by the Industrial Department of the General Government as regards the permissions for export. Also we cannot but remark that this is but one further step in that policy which we have already pointed out on more than one occasion, and which has for obvious intention the reduction of our workmen to an enforced idleness, which will allow the German authorities to employ them, willingly or by force, on work undertaken for their (the German) benefit. We beg Your Excellency to accept the expression of our highest consideration. The attention of His Majesty's Government has been called to the fact that the German authorities in Belgium before allowing any Belgian goods to leave the country insist on the exporters signing an undertaking that the whole amount of the purchase money will be remitted to Belgium and that no part of it will be deposited in the United Kingdom in a blocked account. To make certain that the undertaking is kept the German authorities exact the deposit of a guarantee of twenty per cent of the value of the goods, and at the same time they are levying an export tax of five per cent on old orders and ten per cent on new ones. In view of the above regulations His Majesty's Government feel that they will not be able to continue allowing the export of Belgian goods to oversea destinations. Before however taking a final decision they desire to know whether, in case they were nevertheless to allow such export to continue, a definite assurance can be obtained that the workmen employed in the Belgian factories where the goods are made shall not be deported to Germany. I should be grateful if a communication to that effect could be made to the German authorities in Belgium through the American Minister in Brussels.